* Not all fold options are available for certain sizes. Brochures are a key element of a marketing campaign, as they serve as a constant sales tool for your company. There isn't a better way to highlight the essentials of your business! Extremely versatile, brochures can be displayed in shops on racks, or sent as a direct mail advertisement. This popular promotional tool typically highlights the essentials of your business, including services, pricing, and competitive information. Aside from providing textual information about your company, include graphics, pictures, and charts on your brochures. Insert your full-color brochures in folders with other business collateral and hand them out to clients. We have multiple folding options available depending on the size of the brochures. Folding options include: Half Fold, Trifold, Z Fold, Open Gate Fold, Closed Gate Fold, Double Parallel Fold, Accordion Fold (4 panel), Half Fold then Half Fold, Half Fold then Trifold, and Roll Fold (4 panel). Refer to the fold options tab. The Half Fold then Half Fold is an 8-page fold, and the Half Fold then Trifold is a 12-page fold. Select a folding option that will best fit your design. Make sure each fold panel is easy to follow and clear separate different topics on separate panels for a smoother flow. We do not recommend crossover text and/or images for the Closed Gate Fold. Due to a slight gap between the far left and far right panels, text and/or images will not meet. Got Green - recycled stock available for the environmental enthusiast. Choose one of our Gloss stocks for a beautiful shine, the 70 lb. Opaque Smooth White for a textured look, or one of our Matte stocks for a more subdued and vintage look. Brochures are an excellent way to spread the message about your company's products and services. However, you want to make sure that the quality of your brochure matches the high quality that your business is committed to. At GotPrint, we make sure that each brochure we print is something that will impress your customers and portray your company in a positive light. No two businesses are exactly the same, and we believe that the brochure printing service you select should be equally unique. Add style and flair by creating custom brochures, or get your information into your customers' hands quickly by using one of our attractive templates. We offer a wide variety of brochure types and styles to meet the needs of our various clients. Regardless of the size you select, your brochures will be printed using high-quality equipment and vibrant inks. In addition to various sizes, GotPrint also offers numerous fold options. Half fold and trifold are the most popular fold options, but some paper sizes are also available in accordion fold, open gate fold, closed gate fold and double parallel fold. We believe that offering our customers the most options allows you to find a brochure that perfectly meets your needs without exceeding your budget. Some clients feel intimidated by the thought of creating a brochure that includes several pages. However, you don't need to fear when you select GotPrint! Our amazing team has thought of everything possible to make the process of designing and ordering brochures online quick and easy. You may even choose a manually processed proof, and our team will review your files and folds to ensure your brochure design meets print specifications. If you have already designed your brochure, you can upload it right away at GotPrint.com. You'll be able to preview your design, view size and paper options, and place your order. If you need some help designing and organizing your brochure, you do not have to start from scratch. GotPrint allows customers to use the online designer tool at no additional charge. You don't have to be a software genius to use this tool. Instead, you can take advantage of step-by-step prompts that walk you through the process. When you're finished, you will receive a digital proof so that you can make sure everything looks great. Finally, GotPrint offers professional design services for clients who prefer to have their brochures created for them. Our site offers several budget-friendly professional designer options, including packages that start at around $200. When you choose the professional design option, our team of experts will design your brochure according to your exact specifications. We want to make sure that you absolutely love your premium brochure, so up to eight revisions are always included. 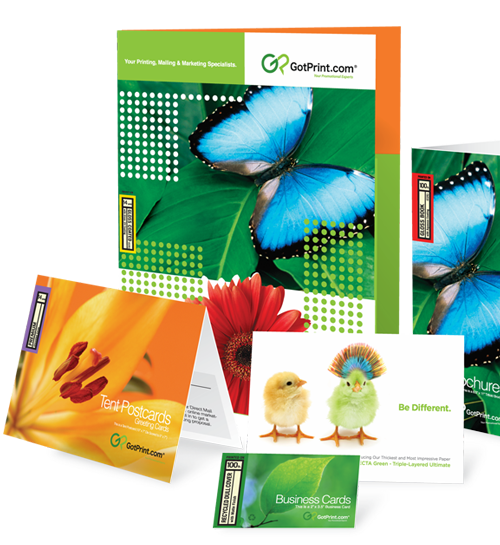 Give your business the attention it deserves by ordering your custom brochures through GotPrint today. We know that time is money when it comes to business matters, so we offer great rates, guaranteed turnaround times and quick shipping. All of our paper stocks are premium and vary in thickness, so no matter what you order, we're sure you will be pleased with your high-quality product. You can choose our popular and cost-effective 100 lb. Gloss Book with Aqueous Coating, or choose our eco-friendly 100 lb. recycled stock. 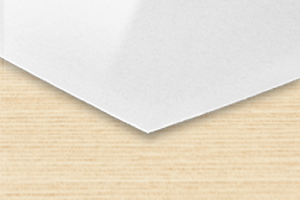 Our multiple premium paper stocks ensure that you find the right paper for your promotional needs. A smooth, glossy paper similar to a soft cover of a booklet/catalog. This favored stock has a beautiful sheen that protects your product from damage and makes colors appear lively and bright. Flexible, yet sturdy and rigid, our 100 lb. Gloss Cover with Aqueous Coating is popular and versatile. Colors appear rich and vibrant, and the Aqueous Coating is sure to protect your product from damage. The thinnest of our card stocks. 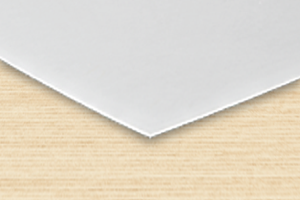 A popular stock for letterhead, envelopes, and notepads, this paper is compatible for use in your Laser or InkJet printer. Bright white, uncoated, and smooth: it's everything you need to make a great impression! Just be sure to avoid dark, heavy ink, as these may cause offsetting. A light glossy paper, that isn't flimsy by any means. This high-quality stock has brilliant color vibrancy and offers protection from damage. In an effort to expand our green initiative, we've brought on FSC certified recycled stocks. Similar to the finish of the 16 pt. Premium Matte Cover, this stock is the perfect option for our environmentally friendly customers! Cover means card stock (thick paper). High Gloss UV is a high gloss coating, Aqueous is a glossy coating, and Matte Finish is a non-glossy, flat finish. You cannot write or print on High Gloss UV-coated stocks, and we do not guarantee that you will be able to write on Aqueous-coated stocks. We do not recommend using heavy, dark ink on uncoated stocks due to offsetting. Glossy stocks provide brighter colors, whereas dull and uncoated stocks provide softer colors. C2S indicates gloss coated on two sides. We require a .125" bleed. E.g., Final Size: 8.5" x 11"
Size with Bleed: 8.625" x 11.125"
An instant proof will be available for you to review and approve. If you select this option, you must check your files for errors, as GotPrint will not provide you with an additional proof. 24 Hours (Excluding Holidays): We will check your files and ensure they have the correct file specifications. If we find any problems with your files, we'll contact you, otherwise you'll receive a link to your PROOF to review within 24 hours. Prices include processing one set of uploaded files and creating a single proof.You can view the status of your order online 24/7 under "My Account." If you have submitted a CD of your files, the proof turnaround will begin after we have received your CD. In addition, for all orders during the holiday season, we will be extending our proof turnaround time by 1 business day. Files not built correctly may delay the order.